There are those posts that are fun to write and flow out of my mind to my keyboard like cold grape flavored Crystal Light going down my throat on a hot summer day. There are also those posts that seem like the four teaspoons of cough medicine that tastes awful, but you know that you really have to just take it so that you’ll feel better. This is one of those. 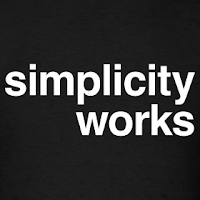 I recently spent a number of days with my family on a mini-vacation (nothing too exotic, since we only drove three hours from Chicago) and my wife pointed out that I tend to complicate decisions by over-thinking things, instead of striving to make things simple. As usual, she’s right. Instead of deciding what to have for lunch, for example, I found myself chesboning what I would be eating later, what snacks I might want, etc. based on if my lunch was to be fleishig, milchig, or parve. It’s sort of the trap that Rav Moshe Weinberger often refers to as “eating from the eitz ha’daas tov v’ra” (I most recently heard this referenced on his Bilvavi I, shiur #9 mp3, but he has also mentioned it in his Oros HaTeshuva shiurim, as well as on Shavuos night a number of years ago). The idea behind this is phrase is that we often over-intellectualize issues, actions, and decisions. For example, let’s say that you see a friend and what to say, “Hi. How’s it going?” If you start hemming about if you really should say “Hi” to your friend, what if he’s in a bad mood, or if you really even care how he’s doing, then you are eating from the eitz ha’daas tov v’ra. You are making a simple thing way to complicated. As I think about a writing project I took upon myself a number of months ago, I see that I haven’t gotten as far as I wanted, because I was very concerned about “crafting” my writing style to the point that it has prevented me from the real act of working on the body of the project. I’m not saying that it’s not important to contemplate things and think out things, but I am beginning to see that at times my own over-thinking gets in the way of both progression and potenial. So here I am, hoping not to really give this topic too much thought and, simply (pun intended), change my ways. Since it’s Rosh Chodesh Elul, I’m figure that I’ve got this month to try to catch myself over-thinking and tell myself, “Stop and get simple”. I guess this is easier written than done. However, Elul itself, is full of simplicity. We have guidelines on how to do teshuva, we listen every morning to the simple sound of the shofar, and with school starting for my kids, I’m reminded that a new year and a fresh start are upon me. This entry was posted in Baalei Mussar, Elul, family, Novardok, personal, Weinberger on August 31, 2011 by Neil Harris. A recently submitted post of mine was just published at beyondbt.com. You can read “Expanding the Backyard” here. This entry was posted in BeyondBT, family on July 11, 2011 by Neil Harris. Isn’t "half-Shabbos" only half bad? This is probably not a surprise, but I’m not in favor of “half-Shabbos”. In fact, I strongly suggest that if you haven’t read Rabbi Maryles’ post on the subject from last week, then you should. Of course, it’s not just high school age teens. I know of twenty-somethings that do this, too. Like germs, technology trends, fad diets, and a funny clip on YouTube… it’s everwhere. 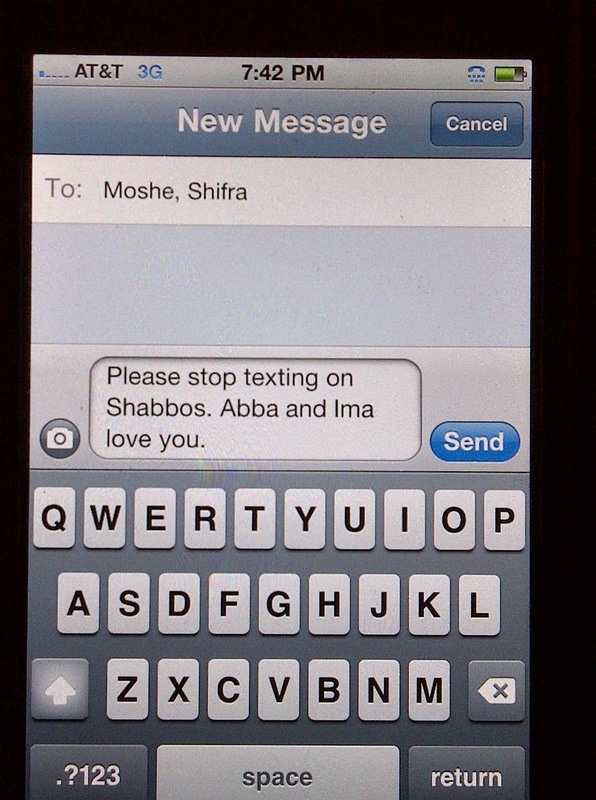 If I found out that my own son or daughter was texting on Shabbos, I’m not sure what I would do (it would probably involved some screaming, sadly). Most likely, I’d start playing the blame game. It’s pretty easy to blame the school and the parents for not teaching our youth to appreciate the beauty of Shabbos. It’s even easier to look at our shuls, Rabbanim, and community leaders and think that if there was more real leadership or a feeling of passion about Yiddishkeit then these kids would feel some busha about texting in parks or behind closed doors. I’ve read about this in blogs for almost a year. I’ve seen the comments, schmoozed with a few friends about this and there’s one question that I haven’t heard. 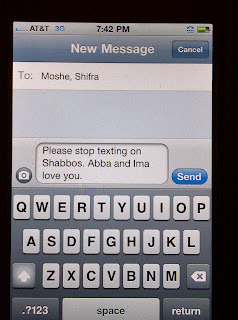 What were these people doing on Shabbos before they started texting and using their phone on Shabbos Kodesh? Probably tearing toilet-paper, picking out the bad jelly-beans from the good ones, watching movies on Shabbos with their iPhones on Netflix (with headphones), chewing treif gum or even something worse. The odds are that someone who is keeping “half-Shabbos” by texting has been involved in other less-headline grabbing aspects of chillul Shabbos for some time. I know, you’re thinking, “You are right, Neil. I’ve read countless articles in the Jewish Week, Jewish Press, Chicago Jewish News, and the Baltimore Jewish Times about so many high school age teens that are being rebellious by double-knotting their shoes on Shabbos.” In fact, if we assur’ed lace-up shoes, then we could stem the tide of kids at-risk. If we want to really isolate the blame as to why “half-Shabbos” has become a trend then we have to swallow the hechshared or other-the-counter-approved pill and look at the person reading this (I’ll take care of looking at the person writing this). It’s us. If you choose to blame the schools or the shuls, then stop. If you think the schools and shuls should be more involved in promoting the concept of Ahavas Hashem and the importance of building a relationship with Hashem then you have to be the one to discuss it with those people in charge. If you think that parents who try to be friends with their kids instead of being parents are to blame for not being more aware of what their kids are doing, then learn how to approach the parents. Now, it could be that parents and educators don’t have the tools needed to approach those that keep “half-Shabbos”. Then we need to pull together Rabbis, educators, Kiruv-types, and adolescent psychologists to figure out a game plan. Reb Yisroel did not take a harsh, uncompromising stance against Sabbath desecration in that setting. Instead, he resorted to a soft, graduated approach. In his first sermon he explained the concept of Shabbos to the people on their level, concluding that chillul Shabbos at the port was intolerable because of the writing involved – the major Sabbath desecration of running a business. He did not discuss the actual portering of goods. Many agreed that they could postpone their writing until the weekdays, while the loading and unloading continued. One of the many things to learn from the above story is that you can’t always have an “all or nothing” approach. That doesn’t work all the time. In fact, we don’t even need to look to a story about Jewish life in 1860, I can look to our times. There’s a group called Reboot who started a campaign a few years ago called the Sabbath Manifesto. It wasn’t started by a kiruv organization, an outreach yeshiva, or an umbrella organization that represents Torah Jews. It was started by diverse group of non-Orthodox Jews. They try to and have been successful in getting people to reduce using communication devices on Shabbos. They even sell a cool sleeping bag to put your cell phone into. The had a national day of unplugging in March and had thousands of people unplug from their phones for a Shabbos. Most social trends like inter-marriage, assimilation, and substance abuse tend to start outside of our own dalet amos and eventually filter into our heimishe velt. Maybe trend of unplugging will reach those choosing to keep “half-Shabbos” and filter into our own heileigah homes and schools. In the meantime, if you’re one of those who keeps a “half-Shabbos” then remember, you’re still half-way closer to “full Shabbos”. * A special thanks to R Yitzchok Lowenbraun and AJOP for featuring this post in their weekly newsletter. This entry was posted in Chicago, children, community info, family, kiruv, lessons, Mussar, Salanter, Shabbos Kodesh on June 28, 2011 by Neil Harris. After the murders in Israel, I will make an extra effort to be thankful and appreciate my three kids. This entry was posted in children, family on March 13, 2011 by Neil Harris. Rav Elya Lopian zt’l, a product of Kelm (as in the yeshiva founded by Rav Zimcha Zissel Ziv, the Alter of Kelm- a direct talmid of R Yisrael Salanter), once commented that the true measurement of a person’s middos is how he or she treats those in their own home. He observed that often people are much nicer to strangers than to loved one in their own family. I, so relate, because I am generally viewed as a nice person to strangers. The reason for this is because a casual interaction with someone in a store isn’t a big deal. It’s a one or two time relationship. It’s not directly ongoing, nor is there much to be gained from investing time or effort into the person at the cash register (although this doesn’t free on from the obligation to make a Kiddush Hashem). With those in your family, it a constant relationship. That’s why it’s more difficult to keep your cool, speak pleasantly, be appreciative, and display a level of kavod haAdam. This is something, especially in dealing with my kids, that I am constantly working on. It’s an avodah in the real sense, because effort is involved. There are times that I win (well my Yetzer haTov wins) and there are time that I slip and lose it. It’s less frequent than it was, say 4 years ago, but it happens. I showed up and gave my name and said I had come for the part of the order that didn’t make it home. They apologized profusely and told me how sorry I was. I told them that it really wasn’t a big deal and that I was sure they were just busy when they put the order together. As I drove home, I realized that it didn’t really make sense that I didn’t adapt this easy going attitude at home. Here I was, telling them “no big deal”, when I had paid for an item and didn’t receive it. Yet, I find myself frustrated and low on patience when I ask one of my kids to pick up their dirty clothes and they choose not to. It’s not like I paid them to actually clean up their clothes. There was no implied exchange of currently for services rendered. There is, however, a relationship built on trust, love, respect, and appreciation. That’s really the kicker. When working with any “volunteers” it’s imperative to appreciate what they do. I realized that my strategy of working on patience and keeping my cool only really affects how I preceive things, or the input, not the output. So, when I came home, I went straight into my son’s room and told him that I really to appreciate all the effort he puts into studying, school work, and I understand that after a full day of school he is sometimes too tired to even care about the state of his room. I also told him that if he wants help pick up close, I’d be happy to assist him. If I can be nice and understanding to the person behind the counter, then even more so, to my own family. At least, that’s the plan. This entry was posted in Baalei Mussar, children, family, lessons on February 15, 2011 by Neil Harris. During my two years of learning in E”Y I would about once every two or three months make my way to the Israel Museum. Who are you close to? It’s a good question. If you are married, then ideally, you are close with your spouse. You might be close with siblings or friends from: high school, college, yeshiva, work, the blogosphere (I think these days that may count), or even Facebook. There are those that we text, Skype, call (I think people still do this), or just say hello to during kiddush. You might be particularly close with a Rabbi/Rav/Rebbe. You might just have one or two really good friends. There are those would might even say they are in the process of attempting to be close to Hashem. I think that we would all like to be close with our children, but not at the expense of what often gets throw around as “kibuv av v’eim”. However, being close with someone means that we have to be willing to share our successes and our losses. If you cheated on your taxes, would you tell your best friend? If you let a “not nice word” slip out of your mouth in a moment of frustration, would you tell the guys you sit with in shul? If you figured out how to make an extra $200 a month by selling certain items illegally, would you tell your wife? If you got a promotion, would you tell your neighbors? Then, there’s R Yisrael Salanter, who said, “A man can live until the age of 70 and still not know himself”. Within these words lies what is part the challenge for those who are attracted towards working on themselves and their relationship with Hashem. It’s that challenge that sometimes drives me. It’s what made me take that postcard at the museum and hold onto it. This entry was posted in family, personal, Salanter on December 23, 2010 by Neil Harris. My parents use to love taking my brother and I for day-trips on Sundays, when we were in elementary school. Mostly these ended up in small towns in Kansas, towns with one grocery store, one gas station, and only one place to eat. 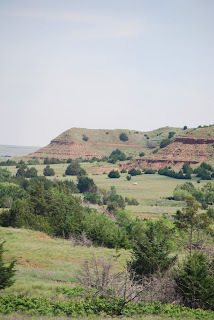 A few times during these Sunday drive we would end up about 80 miles Southwest of our home in Wichita, Kansas at a place called the Gypsum Hills (or the Red Hills). For a little kid it was cool. We’d ride in the car “forever” and then get out and run around, climb hills and collect pieces of gypsum. Good times! What I realized when I was much older was that my parents weren’t just coming up with crazy day-trips to keeps up from watching TV all Sunday. They were attempting to expose us to different scenery from the typical flat-lands of Wichita. It’s the same reason that we went to “young peoples” symphony concerts, art museums, and hung out all week at Riverfest (there are plenty of life lessons to be in watching a bath tub boat race). It wasn’t just exposure to culture, but a desire to give us a broader picture of what life had to offer. My mother, who grew up in Dallas, TX, and my father a”h, who grew up in a small town in Western Pennsylvania wanted to give us an appreciation for the arts and nature. My brother, as a result, became very attached to nature, while I ended up spending many afternoons at that MoMA. The underlying theme of these Sunday trips and countless schlepping to various locations was that giving us a view of the “bigger picture” was a good thing. Today, as a parent of a daughter who is almost 4, a daughter who is a 3rd grader, and a son who is a 5th grader, I see the importance of this. Letting my kids see the bigger picture is key. It helps to give them a frame of reference (and reverence). That’s why I try to point out when someone does a Chessed (kindness) for someone else or when I see an older man or woman davening with real kavanah (concentration), a person who gets new eye glasses l’Kavod Shabbos Kodesh, or an individual who has daily challenges and still remains postive. Those are things that I value. I’m not anti “the arts” nor am I against showing my kids the beauty of Hashem’s world, we do those things, too (mostly as age-appropriately as I can). I think most parents want the best for their own children and attempt to give them/expose them to ideas and values that are dear to them. As I get really to start a New Year, I hope that what I show my children (via my own behavior) things that can have a positve impact on them. This entry was posted in Chicago, Dad, family, Wichita on August 31, 2010 by Neil Harris. Sometimes I kid myself and think of this is a “mussar blog”. It’s really just a personal blog with a bit of mussar that I give to myself thrown in from time to time. Like now, for example. Just over two weeks ago was the first time I had been back in my hometown of Wichita, KS in exactly twelve years (to the Parsha). My dad a”h had been hospitalized and based on what I had heard from family members and at the suggestion of my wife I flew out to be with him. Waiting to board the plane in Chicago, people were dressed up in costume (as it was October 31). I was even asked if I was “dressed as an Orthodox Jew”? That in and of itself made the trip worth it, as a mussar lesson. After an hour and twenty mintues I landed. As I got off the plane and walked past the TSA check-point, I could only smile, remember the dozen water guns that I had packed for family vacations in the 70s and 80s and how all of those water guns had been confiscated. At the time, it seemed like a big deal. In retrospect, most airlines would probably welcome a water gun these days. Not much had physically changed in the Wichita Mid-Continent Airport since I had been there last. They still had coat hook right inside the restrooms (which implied that crime was still low in the city) and the chairs throughout the airport were still the same. The phrase that came to mind was, “if it isn’t broken, then don’t fix it”. A majority of my time was spent at the hospital with my family. Driving back and forth to the hospital I looked at the streets and buildings. Some had been torn down, many businesses had closed, with others opening up in their place. Certain professions seemed to have stayed afloat over the years. Most accounting, real estate, and dentisty businesses seemed to have stayed the same. Several indepenant “fast food” places closed only to have similar businesses open in their place. Aside from having several Starbucks locations not much had really changed. I drove past my old house, the flood prevention program (really it was a creek in my neighborhood that provided my bother and I with hours of adventure), and my old schools. I also connected with a few close family friends from when I was growing up. One of them actually gave a beautiful hesped for my father a’h. I was reminded about the importance of community, specifically a Jewish community. The community in Wichita is pretty much made up of about 1000 Jews split almost down the middle as either reform or traditional. It’s a close knit community where people connect as Jews. Not so much in terms of observance or rituals, but because they are serious about their Judaism. All of my aunts, uncles, and cousins came in for the funeral, as well. Most of them I hadn’t seen since my own wedding almost 13 yrs ago. It was comforting to see them, even under the above mentioned situation. Family comes together when it’s important, but you have to make it important (a lesson I’m learning now). The morning after my father a”h was niftar I stopped off to buy a copy of the local paper at Starbucks (to have a copy of the obiturary and an article that was written about him) and the young man behind the counter introduced himself to me and said that he was sorry to hear about my dad. The manager at the Starbucks was also working and introduced herself as the wife of the Reform Rabbi in town. She also expressed her deepest condolences. That’s the community were I grew up. My family lived in Wichita for 35 years. My father a”h went to the same shul with many of the same people for 35 years. To me that was impressive. Talk about lifelong friends. Wow. I hung out with two old friends that I had lost touch with years ago. We all had good memories growing up of our families doing things together. I’m fortunate that my kids have similar memories with close friends of ours here in Chicago. I ended up spending a just under a week in Wichita. Had it been under better circumstances, I probably would have gotten together with a few old friends from high school. Instead I simply came back to where I was from and now I’m trying to move forward. 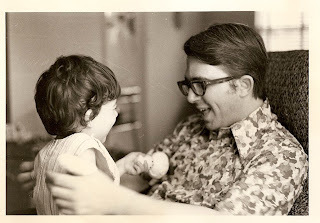 This entry was posted in Chicago, Dad, family, lessons, Mussar, personal, Wichita on November 19, 2009 by Neil Harris. Just last week I was able to view some old home movies from my childhood. These were old 8mm movies that were transfered to DVD. Although my children didn’t really understand why there was no sound, my father and I got a kick out of watching them. For me it was really something very unique. When you look at old pictures you get a feeling for that frozen moment in time, but viewing movies is a totally different experience, even without the sound. I watched footage of my parents playing with me when I was a newborn, my fiirst birthday party, family trips and visits with relatives. While these were all great to view, there was one thing that really got to me. Seeing my father play with me. These images were priceless. It showed a side of him that I hadn’t seen in many years. My relationship with my dad is a very formal one. We talk a few times a week, but mostly it is about things that are really not that important (this is something that is being worked on). To see him playing with little old me in these old home movies really got to me. It reminded me how parents have such a strong love for their children, even before their children are old enough to do things on their own. It reminded me of how much I love my own kids and how fun it is just to play with them. The joy and love that a parent has for a child is, in fact, almost childlike itself. We act silly with our kids, do things to make them laugh, and shower our kids with affection. Eventually the child grows up, life has more demands, and, at times, the parent/child relationship becomes more serious than fun, more formal than comfortable. This is just my observation. The fact that it is Rosh Chodesh Menachem Av only makes this post more meaningful, for if it wasn’t for our Father’s love, Avinu Shebashamayim, we would not be here. The love never stops. This entry was posted in Dad, family, lessons, personal on July 22, 2009 by Neil Harris. With gratitude to Hashem, my wife gave birth to a healthy baby girl this past Shabbos Shuva. With joy, I made a Shecheyonu. B”H, we all made it through Yom Kippur and my wife and new daughter are both wonderful. This entry was posted in children, family, personal on October 3, 2006 by Neil Harris.